Hey, everyone. After a long wait, Soul Eater’s author Atsushi Okubo’s manga Fire Force finally have received a anime adaption. A teaser key Visual also have been released with the announcement. Subscribe to our Reddit Community for latest updates. 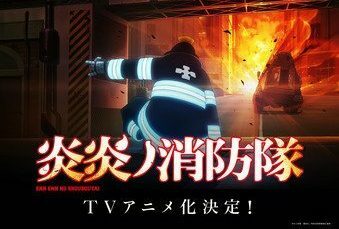 Talking about the visual, featuring our protagonist Shinra Kusakabe in his fire fighter uniform ready to perform his duties. 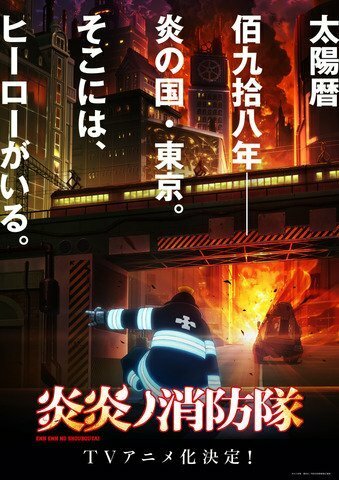 Year 198 of the Solar Era in Tokyo, special fire brigades are fighting against a phenomenon called spontaneous human combustion where humans beings are turned into living infernos called “Infernals.” While the Infernals are first generation cases of spontaneous human combustion, later generations possess the ability to manipulate flames while retaining human form. Shinra Kusakabe, a youth who gained the nickname Devil’s Footprints for his ability to ignite his feet at will, joins the Special Fire Force Company 8 which composes of other flames users as they work to extinguish any Infernals they encounter. As a faction that is creating Infernals appears, Shira begins to uncover the truth behind a mysterious fire that caused the death of his family twelve years ago. As per now no words has been made regarding release date/year. The anime will be produced by David Productions. Also an Official Website has been registered. Fire Force is a Japanese manga series written and illustrated by Atsushi Okubo. It is published by Kodansha and has been serialized in the Weekly Shonen Magazine since September 23, 2015, with the chapters collected into a total of fourteen volumes as of August 2018.